Remz: Run about 1 size small. Narrow width wise around the toe cap. I have put about 4 hours of skating in these and they are already starting to feel really comfortable. I went from a size 9.5 razors SL to a 10.5. I would definitely recommend going a full size up, as my little toe has been getting blisters from the toe box. Right out of the box they have amazing support, yet still flex really well for royales. The sole plates and backslide plate slide super fast and lock on well. I think the power strap is a great addition to this skate. The liner is super comfortable, especially around the ankle, and can be laced up really snug. The materials and build of this skate are high quality and well worth the money. My only complaint is that the liner seems to shift around the bottom of the boot when bending at the ankle. Even then, you get used to it really quick and it does not affect performance. I would recommend these to anyone who wants a super comfortable skate that does not have a solid hardboot construction. Great Skate, I got a pair of these as soon as they dropped. When they say order a size up, THEY MEAN ORDER A SIZE UP. 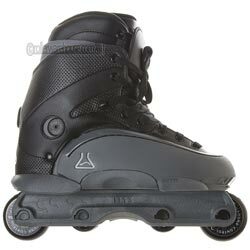 I am a size 9 and ordered a size 9, it took about 3 months before these skates stopped hurting my feet. But after all that leather broke in, they are a great skates. Even though they are higher then most HR remz, that sought after flex is still there. The Fat soul plates are much bigger than the carbon III plates, which makes alley-oop grinds a dream. It has much less FORWARD flex then say the carbon 3 or the xjado, but I have yet to find a skate that provides the superb side and rear flex then the HR. It also slides faster than a carbon III on most surfaces, though I am not sure why.